Lobiani,the hand-held filled pastry, is not just easy to make, but is vegetarian and appeals to the Indian palate. I recently took a trip to Georgia, and completely fell in love with the country. The scenery is beautiful – in parts, similar to Tuscany; the atmosphere is vibrant and relaxed at the same time; the people are among the friendliest I’ve ever met and the food is to die for. The produce is fresh and beautiful and the cooking style is simple, but so flavorsome. Given this, it’s no surprise that when in Georgia, you spend more than half your time at a dinner table. Georgians won’t let you sneak away until you’ve tried everything (and that means eating so much you can’t move). When at a friend’s house in Georgia, however, you don’t actually want to sneak away, since when you sit down, you feel like you’re home. When out at a restaurant, you order a bunch of dishes and share them all. Usually the amount of food involved means there is no room on the table even to put your wine glass down – which is not a bad thing, since you can eat plenty using just one hand! A typical Georgian feast can include chashushuli (beef or veal stew with spices); pork, beef, chicken or fish kebabs; eggplant rolls with walnuts; tomato-&-cucumber salad with coriander and walnuts; pkhali (beetroot or spinach balls) and two obligatory dishes – khachapurik, the cheese-filled pastry also known as the food most likely to ruin your diet; and lobio, beans slow-cooked with herbs and spices. Then there is lobiani, which is a combination of the two. In Georgia, the food is fresh, the spices are full of flavor and the conversations just keep flowing. Even after you get home, you want to keep the party going. 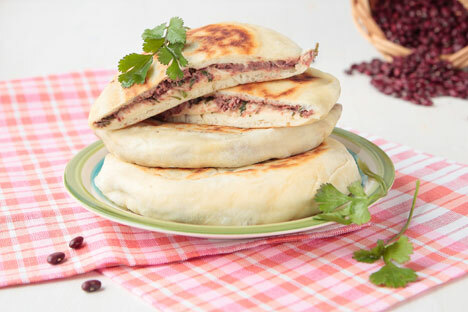 Lobiani is one of the easiest Georgian dishes to make – and also to eat – which makes it a great party food. The only thing to keep in mind is that because the dough is yeast-based, you will need to start making the pastries a couple of hours ahead when you plan to eat then. Also, although traditionally you’re supposed to boil the beans, I cheat and buy canned beans so I can eat the lobiani sooner! And canned beans work just as well. 2. For the dough, warm the yogurt (or curd or sour cream), add the yeast, sugar and salt. Leave for 10 minutes to let the yeast activate, then add the egg and mix well. 3. Pour into a bowl and add the flour until the dough is quite thick – then put in on a floured surface and keep adding flour and kneading until you have smooth dough. Cover with a kitchen towel and leave in a warm place for about an hour to rise. 4. For the filling, put some oil in a pan and add the onion. Sprinkle with salt, pepper, basil and paprika. Then add garlic and chili paste. Fry until the onion is soft, then add the beans. Mix well and mash the beans. Add the fresh coriander. 5. When the dough has risen, knead it again, then set it aside for about 30 minutes to let it rise a second time. 6. Once the dough rises for the second time, knead it and separate into 8 parts. 7. Roll out each part and put about 2 teaspoons filling, close and roll a little but make sure the filling doesn’t come out. 8. Bake for about 10 minutes at 220 celsius (430 farenheit) or until golden brown.